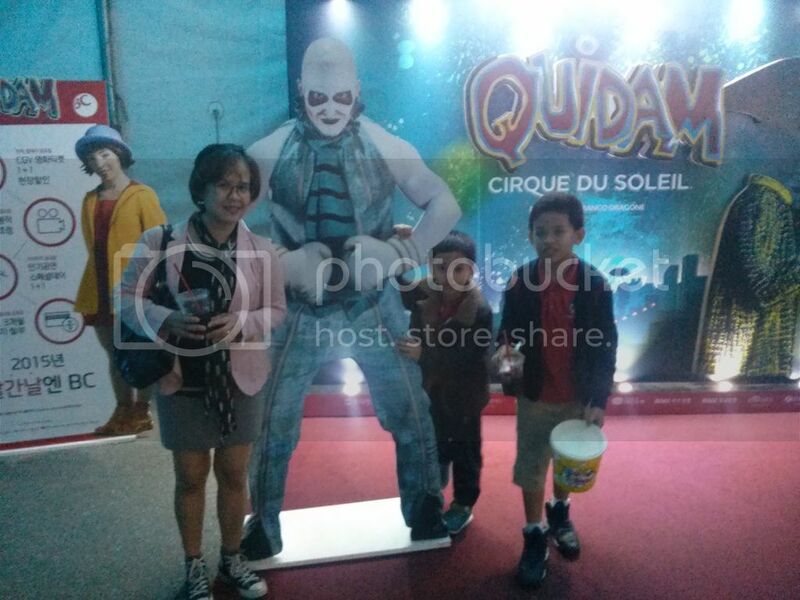 Kids and I went to watch Cirque du Soleil’s “Quidam ” last night at Jamsil. It was my first time to watch a circus live. So, I was as excited as my sons! It was such a nice feeling to be as excited as them. I felt like I was a kid again holding on to the anticipation of being transported back to childhood. What’s with these tents that make us all giddy with childlike wonder? I allowed my sons to lead me with their enthusiasm last night. I would have wanted to take more pictures (and I did bring my DSLR – which stayed in my bag the whole time) but I can’t ruin the boys’ enthusiasm by letting them wait and pose for pictures:-). It was a new experience for the boys. Unlike the movies and stage plays, this is a live performance with so much going on on the stage. Performers are all over so their focus is also driven from one point to another. But they enjoyed it so much it was worth going all the way to Jamsil at night, way beyond their bedtime. It’s amazing how a circus can make you feel so great! I miss getting excited with childlike wonder. I hope I can see the circus soon! Hey thanks for sharing! I have never had the chance to attend a show like this, I’ll have to watch out for any future Cirque du Soleil performance. Looks amazing! I’ve always wanted to see this performance so I’m quite jealous! Congratulations on experiencing your first circus. It’s great that you were able to experience this along with your boys and share in their excitement. Hedgers Abroad recently posted..Let’s go to… Jeonju! I’ve seen the promotion for Cirque du Soleil but you’re the first review that I’ve seen. It looks like you all had a blast. Hopefully I get to make it out to a show. I didn’t know Cirque du Soleil was in Korea, that’s great that you got to see it! From the clip, it looks like it would be a fantastic show. Thanks for sharing! I love watching live things, like plays / circus acts / ballet etc. It’s great that even in your adult life you got to do something new 😀 I wish Seoul was closer, I would of loved to watch this here too (although I have seen them before elsewhere)! very cool! i did not know that Cirque du Soleil tour Korea! that’s great to know! Seems like you guys had a lot of fun there! Thanks for sharing! Wow, I have never watched it before. From the preview, it looks dazzling and fun. That is another eye-opener for me. Thanks for sharing. Great post! I really want to see Cirque de Soleil at some point in my life. I appreciate the humor that is integrated into the act. Thanks for sharing! I had the chance to go with my Mom to one of their shows in Jacksonville, FL. I love this type of show! I haven’t been to another since and will have to make a point to go to another one. I prefer this over the traditional circus. The acrobatics and colorful costumes are so much more entertaining. Glad you and your boys had a great time. Very entertaining. I love it that they infuse comedy in some of the scenes. My sons enjoyed them very much:-). WOW! I had no idea that Cirque came to Korea!! I’ve seen a few shows back home and they were absolutely stunning! Thanks so much for sharing this, I’m gonna look at tickets! Great that you’ve watched some of their shows already. They’re amazing! Oh wow! I had no idea this was in Korea! Thanks for sharing! Maybe we will have to go see it! You can still catch it:-)… The show’s until November 1. Enjoy!